Evergreen - White Styrene Sheets 6x12 .030 thick Discounts Apply ! Evergreen White Styrene 6" x 12" Sheets, .030 thick. 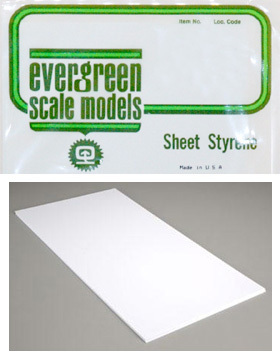 Evergreen Scale Models is the world's largest producer of styrene plastic shapes, strips, and sheet materials in metric and inch sizes. You can build clean, accurate models using Evergreen white styrene sheets. White Styrene Plastic sheets from Evergreen Scale Models. White styrene are sturdy and durable for any model prodject. Flexible plastic sheets may be cut to fit your needs for any size scale of structure. Used for bracing, building walls, armor platting or wherever flat stock is appropriate. Ideal for all facets of scratch model building. These precision styrene plastics are user friendly and economical. 6" x 12" Sheets.